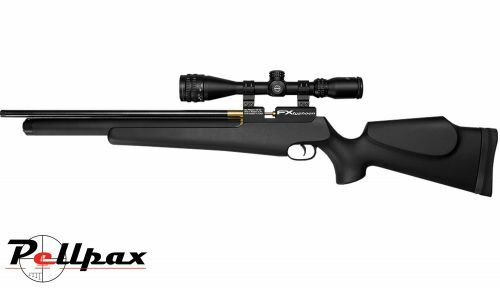 The Typhoon from FX Airguns in Sweden is a high quality, lightweight air rifle with a sporter stock, which is suitable for almost any type of shooting. The simple bolt action system has very few moving parts which ensure many years trouble free shooting, and superb accuracy. Being a PCP rifle there is no recoil from the rifle allowing you to hold the rifle a lot more steady to hit your target first time, every time. The Synthetic stock is very well crafted, and is ambidextrous to fit both right and left handed shooters to make it a very flexible rifle. The Rifling is FX's own Smooth Twist design to a Match Grade standard and it is produced by Lothar Walther to give the very best results in accuracy and precision. The Air cylinder has a capacity of 185cc allowing these rifles to achieve around 100 shots from one fill. Add this item to your basket & spend an extra £48.00 to apply for finance.